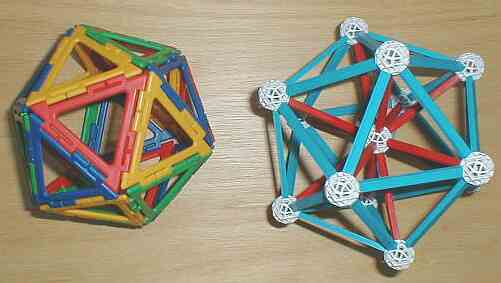 Frameworks and Zome are both geometric construction sets made of plastic pieces which snap together. 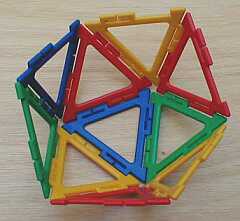 Frameworks' plastic pieces are polygons whose edges snap together. Zome's pieces are struts and balls. Struts come in different lengths and colors; each color has a different polygon on its ends. The ends of the struts fit into the openings on the balls. The larger Frameworks sets include: small and large equilateral triangles, right triangles, isoceles triangles, squares, pentagons, and hexagons. Some kits include rectangles. 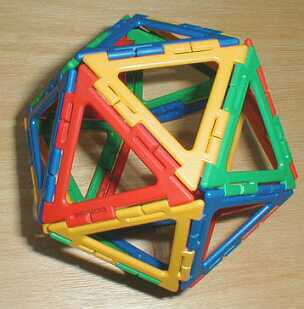 Both geometric construction sets are highly flexible; children as young as age six can build simple models, while older youths and adults are stimulated and challenged by complex models. 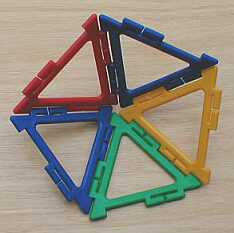 Frameworks is one type of geometric construction set produced by Polydron, a British company better known for its Polydron sets of solid pieces. The Math Cats like the open Frameworks pieces better; they are lighter and easier to snap together since you can put your fingers right through the pieces if you need to. Also it is easier to measure the angles if you like, and it is fun to see right through a 3D shape from different angles. It is easier build models with Frameworks than Zome, and there are fewer pieces to keep track of, but the Zome system makes it feasible to build more complex models which can be large enough to sit in! Below, we demonstrate how to snap together an icosahedron (consisting of 20 triangles) using both geometric construction sets. It is easiest to snap together pieces when at least one of them is flat on a table. When possible, place both pieces flat and slightly overlapping and press down on an edge until it snaps into the next edge. 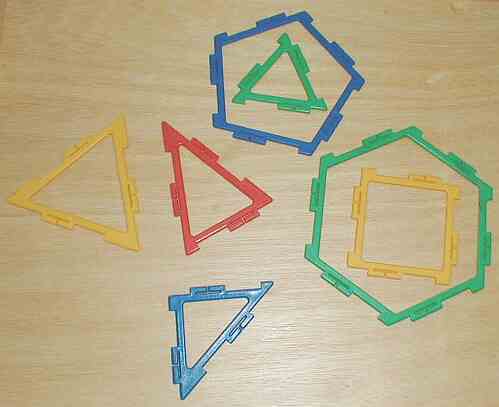 In this model, after you snap together 5 triangles, you need to join the edges of the first and fifth triangles. Snap on 5 more triangles to form half of the finished model... then snap on 10 more and close the icosahedron. 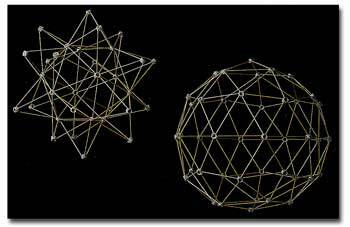 A Zome icosahedron needs to be built upon a supporting structure. 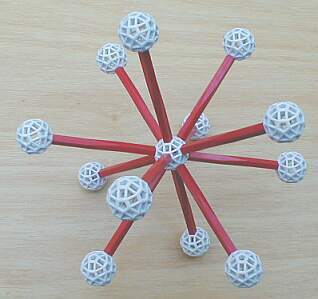 Fit red struts (with pentagonal ends) into all twelve of the pentagonal openings in one ball to form a "star." 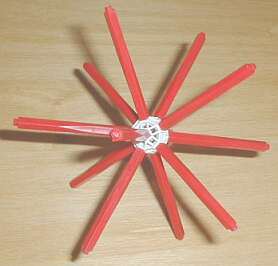 Place a ball on the end of each red strut. 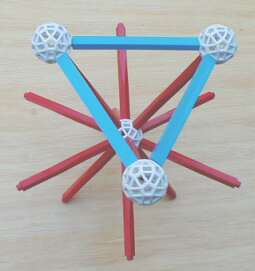 Begin connecting the balls with blue pieces to form triangles. It takes a little extra pushing to fit the last strut into place! You might have to loosen the last ball from its red strut to get the blue pieces to fit and then press the ball back down onto its supporting strut again. 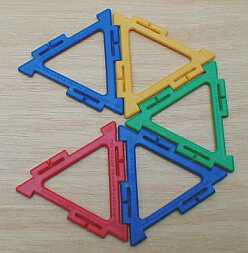 The British Polydron company -- www.polydron.com -- makes a variety of snap-together geometric construction sets, including Frameworks and Polydron. Polydron and Frameworks are also sold through websites in other countries; shop around to minimize shipping costs. A large selection of Frameworks and Polydron sets with reasonable shipping charges are available in the U.S. through Alan Nashleanas of Gray Matter; browse the Polydron site to make your selection and then place your order with Alan by e-mail -- avagadroxexpi@mho.com -- or by phone: (303) 238-1192. Tell him Wendy of Math Cats sent you! 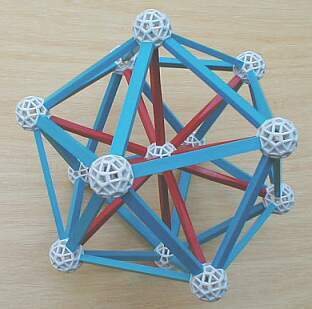 Zome -- www.zometool.com -- offers a variety of Zome construction sets as well as a book of ideas and how-to instructions. Some of these geometric construction sets are a bit pricey, but we think they are worth it: they are fun and educational and can be used in lots of creative, open-ended ways as well as in structured math lessons. The Math Cats love playing with Frameworks and Zome! Plato's Glo-Mobile Set comes with about 400 sticks and glow-in-the-dark rubber connectors for building geometric shapes. This set and a few other geometric building sets can be found at Math Art Fun. * Soma Blocks or Soma Cubes are sets of seven blocks formed from 27 small wooden (or plastic) cubes, glued into each possible irregular arrangement of 3 or 4 cubes. 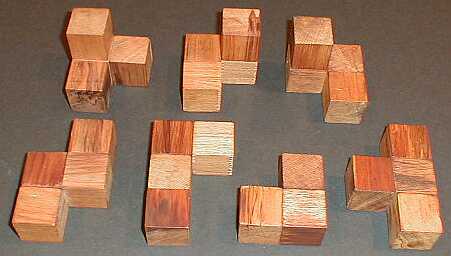 The seven Soma blocks can be arranged in hundreds of different ways. There are over 200 ways to make the Soma cube. 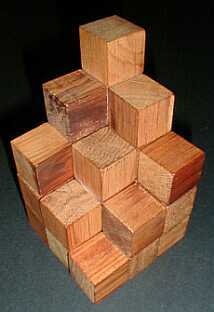 A cube can become a staircase just by flipping one block into a new position! You can make your own Soma cube of seven Soma blocks from small wooden cubes which can be purchased inexpensively online in a variety of sizes at Wood N Shop. A popular size is one inch (14¢ each); 3/4 inch (8¢ each) would work, too. 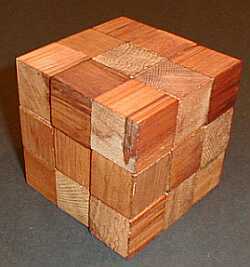 You can get 100 1" wooden cubes for $10.95 or 500 cubes for $49.95 at EAI Education. You can stain or paint the cubes before gluing them, then follow the assembly instructions at Jon Basden's Soma Cube Central site. Wouldn't handmade Soma block sets make great gifts or a great class project? © copyright 2002 - Wendy Petti of Math Cats. All Rights Reserved.